In IEEE Transactions on Multimedia 2009. Social image analysis and retrieval is important for helping people organize and access the increasing amount of user-tagged multimedia. Since user tagging is known to be uncontrolled, ambiguous, and overly personalized, a fundamental problem is how to interpret the relevance of a user-contributed tag with respect to the visual content the tag is describing. Intuitively, if different persons label visually similar images using the same tags, these tags are likely to reflect objective aspects of the visual content. Starting from this intuition, we propose in this paper a neighbor voting algorithm which accurately and efficiently learns tag relevance by accumulating votes from visual neighbors. Under a set of well defined and realistic assumptions, we prove that our algorithm is a good tag relevance measurement for both image ranking and tag ranking. 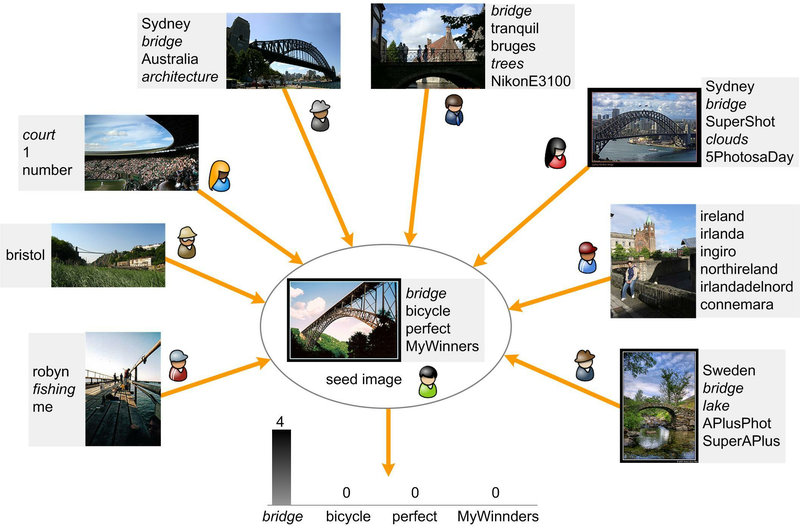 Three experiments on 3.5 million Flickr photos demonstrate the general applicability of our algorithm in both social image retrieval and image tag suggestion. Our tag relevance learning algorithm substantially improves upon baselines for all the experiments. The results suggest that the proposed algorithm is promising for real-world applications.